Analysis shows tidal forcing is a major factor in ENSO forcing | Watts Up With That? Here on this page, you are going to find evidence that tidal forcing is one of the most important, if not the most important driver for ENSO variations. That tidal forcing could be the main explanation for ENSO variations was something I stumbled upon when I examined possible ENSO drivers. After the previous results which I got when I was using an Artificial Neural Network ANN and where I did an analysis of the correlations between the global mean temperature and possible forcing drivers, which can be viewed here, I turned my attention to the ENSO index by looking into the Multivariate ENSO Index (MEI). One thing I found when I analyzed the result from correlations to ENSO was that there is a strong correlation between variations in Earth’s rotations both to the global mean temperature and to the ENSO index. What we are talking about here are small variations in Earth’s rotations, which are in the order of milliseconds. One other factor with correlation to the ENSO is of course SOI, but I also found correlations to SST, PDO, and the Kp and Ap indexes. From this, I concluded that either it is ENSO which is driving changes in Earth’s rotation or it changes in Earth’s rotation, which is causing variations in ENSO or more likely it is some combination of both. Proof that ENSO and variations of Earth’s rotation are proportionally correlated to each other has been known for some time. This can be seen here. The mechanisms which tie ENSO and variations in Earth’s rotation together are caused by sea current changes, changes in trade winds or by displacements of water between the equator and slightly higher latitudes. This all makes sense. The water currents in the northern hemisphere follow a clockwise pattern, and in the Southern hemisphere they follow a counterclockwise pattern because of the Coriolis effect. The trade wind and the currents near the equator are moving to the west. However the Current closest to the equator called the equatorial counter current move to the east. Still deeper at depth down to 200 meters at the equator an ever stronger current is moving to the east. The behavior of this current of the Equatorial Pacific is shown on this page by Bob Tisdale. The only mechanism by which ENSO can be driven by changes in Earth’s rotation is by variations in the tidal force. My next step was to try to include tidal forcing in my ANN. I then got three problems, which I had to overcome. Firstly: I had to find data over the position and distance to the Moon and to the Sun. Eventually, I found software from which I could get this data, although it gave limited information and I was only able to print out time and position when the Sun and the Moon were closest and farthest from the Earth and with the Moon I could also calculate the time and position of the new moon, the full moon and the moon nodes. The Moon nodes are the location where the Moon cross over the ecliptic plane. Secondly: I had to find the formula for the tidal force vector and implement this into my software. Thirdly: I had to figure out what features in the tidal forcing which could affect ENSO. I had to experiment with different configurations based in my limited and rather crude data. To do this, I had to make complicated trigonometrically calculations in order to get the right value of the tidal force. Eventually, I got good correlations between ENSO and the tidal forcing. By this time, I had figured out which features in the tidal forcing that were causing this correlation. However it was not a direct correlation with ENSO, rather it was a correlation with the derivate signal of ENSO, i.e. it was affecting the rate of change of ENSO. The correlation to the change of rate in Earth’s rotation, on the other hand, is direct. This means that tidal forcing is causing the rate of Earth’s rotation to either speed up or speed down. The rate of rotation is then responsible for changes of the ENSO index. One reason was that it was difficult to identify, which features, which cause correlations. This was because each tidal forcing point I use the sum of monthly calculations. The size of the tidal forcing changes each and every day and how to summarize this data the right way into useful functions, which can be used to construct values that could create good correlations were difficult. Of course, the tidal force is not the only factor which drives ENSO, but it is the most influential factor. To test if that would be the case I ran my network with the right tidal forcing data. I also included feedback loops back in the network from the output ENSO values to some of the input nodes. After some testing and individual adjustments of the internal components in the artificial network, I got good results. Following on my earlier experiment of the ANN on the mean global temperature I trained the ANN from late 1978 up to the end of 2004. I used the time from 2005 up to the late 2011 for test the calculations, in order to find the minimal error function. This is the result I got. The exciting thing with this result is that it is possible to make forecasts for much longer times into the future. Today’s predictions use computer models and are only able to make credible predictions 4 to 5 months into the future. While in my case, using my ANN calculations based on tidal forcing can be made for forecasts for an almost unlimited time because the Moon and Sun’s positions into the future are known in advance. Although, I have to stress that with the predication so far it is not possible to get the last figure right. Currently, it is only possible to make an estimate with a relative high likelihood at any date if ENSO are going to be positive, negative or neutral. However, as can be seen here the predictions are not always correct. The main large El Niño events of 1982 and 1998 can clearly be seen, but the large magnitude of these events can not be predicted. I later made a ENSO forecast from late 2011 up to 2020. I cannot show the result here because of proprietary reasons. This picture shows the test period and some of the forecast which ends in early 2013. Note, however that the calculations from this graph, the ENSO index uses ENSO feedback values which all are from estimated ones. Those are not the real ENSO values. Now Look at: the previous graph with the whole time span from 1979 up to 2011! On this graph, look at the beginning at the 3 first years from the start of 1979. These 3 first years have all exceptional good correlation to the real ENSO values. The difference with the start values in this case is that I use real ENSO values for the feedback values in the network calculations which are going into the calculations with values before the graph begins. This is because in my ANN, I use for every calculation point values which goes 3 years back in time and I must use real input values for values before my first calculated value. If I would make a forecast for the next years using current real ENSO values from 3 years back and up to the current date, my forecast would be greatly improved and would be much better than forecast made with current computer models. There were 2 important events that happened the years just after 1979. The first was the eruption of El Chichon in 1982 in Mexico. The second was the unusually strong el Niño event between 1982-1983. My calculated values after 1982 of ENSO tend to come out of phase after and around 1982, and the ANN seems not to be able to handle strong El Niño’s very well. After some years, the estimated ENSO value deteriorate somewhat mainly because of errors in the feedback caused by the inertia in Earth’s rotation. In contrast to computer model forecasts, I don’t use data from the Tropical Atmosphere Ocean TAO network which is a NOAA measurement network of buoys in the tropical Pacific that deliver real time data which feeds these ENSO models with real time data. Here is a result from the same program, but as input it uses variations in the Earth’s rotation instead of tidal forcing. As you can see, the correlation to the Earth’s rotation makes the result much better. However in contrast to tidal forcing, future changes in Earth’s rotation is unknown. Here is another graph from the same program with feedback but this time the input signal is only from SOI Southern Oscillation Index. As expected SOI is closely related to ENSO. Here is a repeat with the same program, but this time with a combination of tidal forcing, changes in Earth’s rotation, SOI, Kp and the Ap indexes. As you can see, this result is similar to that of the previous with only SOI. The next step I plan to take is to use the ANN with real time data and make more accurate ENSO predictions for the next 3 to 4 years in to the future. I also want to test with real ENSO input data for several time periods in order to evaluate statistically how the good predictions can be based on real time ENSO feedback input data for the beginning. After that, I want to improve on my result by using more precise and accurate tidal calculations. I have found a program from which I can make precise calculations of the Moon and the Sun on a daily basis. Other factors I plan to look into are the mechanism of the Kelvin wave, Walker circulation and MJO which all should influence ENSO to some degree. So far I have only looked at ENSO. I can easily switch to SOI, NOI and changes in Earth’s rotation and use that as an output for predicting ENSO with the ANN. Conclusion from my result is that tidal forcing is as a major factor in ENSO forcing. I now have gotten new questions. Compared with other causes how important is the effect from tidal forcing? Is it possible to find an increasing effect from tidal forcing by improving the tidal data I use? Is it, for example, possible to identify tidal forcing as the cause for the strong El Niño of 1982 and 1998? It may be possible to get better ENSO results by using predictions based on SOI, NOI, Earth’s rotations or by starting from tidal forcing only. I’ll test and see. Also, ENSO and SOI are parameters for which there exists long historical data records. By, using a longer time span for training and testing, the accuracy of predictions based on ANN should be improved. I acknowledge that it is not easy to find correlations between tidal forcing without testing out the right feature and by using am ANN. However I do find it very strange that no scientist to my knowledge has been looking into a possible connection between tidal forcing and ENSO in any depth. As can be seen from what the IPCC writes about ENSO predictions, they do not have a clue. The current data models that are in use can only predict with any accuracy 4 to 5 months into the future. When it comes to the ENSO drivers, these researchers think chaos theory and random noise are the mechanisms which explains the causes of ENSO changes. However Cerveny, R. S. and J. A. Shaffer (2001) et al. in the report, The Moon and El Niño, Geophys. Res., writes about the Moon cycles and ENSO, where they find correlations between the solar cycles and ENSO. To me at least, it seems that the solution to long range ENSO prediction has for a long time been right in front of the eyes of these researchers, but nobody has taken up the challenge to figure it out. I see the same reason why the climate community at large has not studied tidal forcing as an explanation for ENSO variations and why none TSI solar forcing as an additional cause for climate forcing ignored. The primary reason is that they have had their education in meteorology, atmospheric physics, thermodynamics or in computer science. Most of them are specialists in a few narrow disciplines, and as such they prefer only to apply knowledge from the fields they know. They are not generalists and display strong resistance for applying knowledge from other area from which they lack knowledge. Then add to that group thinking, peer pressure and lack of funding for research in alternative causes of climate change and this explains the current one-sided situation. This is one of reason that predictions made with computer simulations are failing. I just love it when some thoughtful science develops correlations that make perfect sense in the real world that we can all relate to – small sea level changes around the world making changes to the angular momentum and driving current variations makes good sense. And the work can be checked ………. brilliant! Research & analysis on this blog & Climate Audit are infinitely superior to the vast majority of climate anti-science on even the most prestigious pal-reviewed journals like Science & Nature. Oh no Mr. Bill! More pieces to the puzzle. “Climate Science” isn’t the only area of science that suffers from too much specialization, but it may suffers the most. It does appear to be the only one where even knowledge of the scientific method is considered outside the specialty by most. Only mechanism? Driven by changes in Earth’s rotation? Neither of these is either proven nor (IMO) provable, certainly not from observing a correlation. Note, back of the envelope-wise I wouldn’t expect this effect to be terribly great. The baseline moment of inertia of the Earth itself is enormous compared to the minor fluctuations associated with either tidal deformation or thermal deformation anomalies in what is (at most) less than a meter of the the meter radius ball. Even throwing in atmospheric expansion seems more likely to at most create a coriolis deflection and alter the jet stream or deflect oceanic currents more than vary the actual rotational period of the Earth itself, but then, you’re talking about tiny variations of the latter. With that said, the harmonically driven system is highly nonlinear, chaotic, and lagged, so there is always the possibility of resonance phenomena and quasiperiodic phenomena. But by the same token, it is quite possible for there to be correlations that are either accidental or both driven by a third (unknown) cause. Post hoc ergo propter hoc is a fallacy, which is why just building neural networks or other sorts of nonlinear statistical models (even when they work quite well) doesn’t allow one to make any strong conclusions about what causes what. You might want to look at global atmospheric angular momentum data as well which is also quite correlated with the ENSO. Charted back to 1958. Lower atmospheric levels only. There is a bunch more info here. Nice analysis, but you know very well that accurate prediction is the ultimate test. Just a reminder (although the trolls will remind us) that the reason that Russia and parts of Eurasia are experiencing record breaking snowfall- http://rt.com/news/winter-snow-russia-weather-275/ -is because warmer air holds more moisture (and it’s our fault). That’s the meme, isn’t it? Further more the ENSO can be directly correlated to the tectonics of the subequatorial Pacific. This looks like it is very significant. Well done. Thank you for the beautiful demonstration of causes and consequences. It is a wonderful departure from unsubstantiated speculations about trends in climate predictions. It is confidence-inspiring to see someone build on Bob Tisdale’s work and to take that into new directions. The findings by Per Strandberg ought to be very interesting for Nils Axel Mörner. With an important article like this one it is important to get the title absolutely right. There is a typo. The phrase “is as a major factor” should read “is a major factor”. Are you sure that the Mass differentials of the Bulges of warm and cool water during ENSO cycles across the surface of the pacific could not be the cause of the orbital differences detected. The word “causation” as in “Correlation does not imply causation” is missing from this article. (Chart: Deviation of length of day, 1965-2010), changes that ammount to no more that 2 milliseconds per day per month, is the driver of ENSO. It is far more likely to me that the redistribution of 10^21 kg of water at various temperatures, of which the ENSO Index is only a measure, is the cause of changes to the Earths angular moment of inertia and therefore is the cause of TINY changes to the length of day. Reviewing your analysis on climate drivers I’m not convinced there’s a low correlation between SSN (sunspot #) and temperature considering my own neural network definitely detects a correlation albeit over a much longer time span than you seem to be looking at: “I’m talking about weather related pulses which is entering into to the Earth climate system as this result is a match against the derivate (short time variations) in the global temperature signal.” If I were to graph the insolation every hour for some point (especially if a good distance from the equator) for an entire year I’d have 1) a really long graph and 2) a series of bumps that go from zero to max every day with these bumps increasing/decreasing in size and increasing/decreasing in density (length of zero in between bumps) as the year progresses. Obviously, insolation is a major driver of local temperature. Note the temperature max lag from insolation max (the hottest time of the year is well after the summer solstice when the bumps would be the largest and most closely packed). My neural network detects this same pattern in the SSN-GAT (global average temperature) albeit incomplete (not a full cycle) unlike our hypothetical annual hourly insolation graph. Just something to mull over. I applaud your efforts, sir. Keep going; it’s very interesting stuff. Too many correlations that could causally go either way, and too much fitting to get the right results for me to think this is conclusive. Beautiful piece of speculation, I reason thus, using this data, show me my error. Science is moving away from the secretive journals and paywalls, and back into open discussion here on the web. Very interesting argument and pleased to see some one following up on Bob Tisdale’s work. Tallbloke will be interested in this. Color me unimpressed … the claims made in this paper are waaaay stretched. 1. He has not demonstrated, cited, or established in any way the claim that ENSO is “driven” by changes in earth’s rotation. 2. He has not demonstrated, cited, or established in any way that “variations in the tidal force” are related to ENSO. Thirdly: I had to figure out what features in the tidal forcing which could affect ENSO. I had to experiment with different configurations based in my limited and rather crude data. To do this, I had to make complicated trigonometrically calculations in order to get the right value of the tidal force. Eventually, I got good correlations between ENSO and the tidal forcing. Say what? Am I reading that right? He “made complicated trigonometrically calculations” until he finally got a good correlation? A correlation with what, exactly? 6. He keeps adding variables to the mix, which is a very, very bad idea. Where is the “tidal force” in that? You know, the tidal force he did all of the complex calculations for, the calculations that he didn’t show us? How is that missing from his list of the mechanisms tying the ENSO to variations in LOD? 8. If I were to look at ENSO and variations in earth’s rotation, I would never make the assumption that the causation is going from changes in rotation to the ENSO. Going the other way, it makes perfect sense that the ENSO changes would affect the length of day (LOD). The ENSO pump moves huge masses of water around the planet. It would be surprising if that didn’t change the LOD. Anyhow, that’s just a few of the big holes in this analysis. There’s more, but I can’t be bothered. I find it fragmentary, lacking in both logical and evidentiary support, and completely unconvincing. Some folks may immediately see what y axis values are or the values may be buried in the text. However I tend to skip directly to the graphs for a first look and in this case became confused by what is being shown. There is rotation of the earth’s axis of rotation (like a mini precession) that occurs during a 14 month period and it is called the Chandler period. In those 14 months, the rotation axis can swing through a circle that is as small as 4 and as large as 10 meters in diameter. I wanted to see if there was any comparison of tidal forces to the Chandler wobble. As ENSO variation tends to be caused by changes in the trade winds and that changes in the trade winds could well result in changes in rotation speed, I’m not seeing much here. The trade winds flow opposite the rotation of the earth so strong trade winds would tend to slow down the rotation a smidge and weak trades allow it to speed up a little. Seems like a sort of “water is wet” conclusion to me. You can think of that water piling up in the West Pacific Warm Pool as a result of the brake being applied by the trade winds and the sloshing of that water back east during El Nino as a result of releasing that “brake”. Excellent. Please continue with the very important plans you have. I believe you have materially advanced the case that tidal forces are a major player in earth’s climate. Many misconceptions might be attributed to language barriers. The author refers to a more complete exposition that is in progress. I await that, my curiosity piqued by this post. All calculational details (those trigonometric functions, how derivatives of data are calculated) need to be supplied. The test of the model is its ability to make accurate predictions of the future. Computational Neural Networks have weaknesses common to all high-dimensional multivariate time series methods; sometimes they produce good results, and sometimes they do not even produce unique results with the same data. In your post on Moon wind, I was wondering if you considered the possibility that the slight temperature change due to the moon was caused by the slight change in gravity experienced by the atmosphere that results in a slight modulation in the adiabatic lapse rate. I think it would tend to show up under dry conditions. You seem to have assumed that changes in the rate of Earth rotation causes changes to what ENSO measures without investigating whether it could be the other way round, or whether both are influenced by something else. (Chart: Deviation of day length, 1965-2010), shows changes that amount to no more that 2 milliseconds per day per month and average out to less than 0.5 milliseconds per day per year. It is far more likely to me that the redistribution of 10^21 kg of ocean water at various temperatures, of which the ENSO Index is only a measure, is a cause of changes to the Earth’s moment of inertia and therefore is a cause of TINY changes to the length of day. Earth Tides caused by the sun and moon are also an element of the angular moment inertia. Couple earth tides with complicated lunar orbit eccentricity and node precession and there are many known dissonant elements affecting moment of inertia and Length of Day. What in fact to you mean by “Tidal Forcing”? Yes, there are tidal forces, but you seemed to be selective about which to use. I had figured out which features in the tidal forcing that were causing this correlation. Tells us how each liter of ocean water can tell which feature to heed. You were quite vague about that “Tidal Force Vector” This was because each tidal forcing point I use the sum of monthly calculations. The size of the tidal forcing changes each and every day and how to summarize this data the right way into useful functions, which can be used to construct values that could create good correlations were difficult. What comes to mind is “With four parameters, I can fit an elephant….“-von Neumann. The correlation to the change of rate in Earth’s rotation, on the other hand, is direct. This means that tidal forcing is causing the rate of Earth’s rotation to either speed up or speed down. Tidal forces do affect the moment of inertia, and therefore length of day. This is not new. The rate of rotation is then responsible for changes of the ENSO index. That does not follow. You must do more to show causality. Even if ENSO and LOD changes are tightly coupled, they may both be driven by a common action. Can you find a way to drive ENSO via changing sun and moon’s tidal forces without first going through LOD effects? In 1967, as a graduate student, I stood on the top of an active volcano (Irazu) in Costa Rico and saw the Pacific ocean to one side and the Atlantic to the other. Over the course of the summer, I spent time on both coasts. The tides on the pacific side were huge- probably 8-10+’. The tides in the Caribbean were almost unnoticeable. I wasn’t studying tides, so only took it as an observation. Just sayin. Although I agree with Willis’ observations, I like new ideas and openness, both of which I see here. Push onward please. There is a sort of up and coming fashion these days about “tidal forces” playing some sort of major role in everything from climate to volcanism. While I do believe that tidal forces might play some role, I don’t believe it is significant. If a tidal difference sets off a volcano or earthquake, then it was right on the hairy edge of “going” without it anyway. I think the changes in rotation are an effect of changes in the trade winds which also cause changes in ENSO but I will be interested to see what else is coming on the subject. If you can’t show results you should not publish. Is that so hard to understand? Really, this statement tells me all that I need to know. The global temperature function is determined from i.) the solar tides and ii.) the ENSO or ONI impedance geometries. I disagree that tidal influence has anything to do with ENSO. ENSO is made possible by the fact that in the Pacific both equatorial currents are blocked and as a result the warm water they carry piles up to form the Indo-Pacific Warm Pool, the warmest water on earth. This does not happen in the Atlantic because the horn of Brazil directs both equatorial currents north and there is no place for any water to pile up. When the Indo-Pacific Warm Pool is full gravity flow starts east along the equatorial counter-current and an El Nino wave forms. It can be observed by satellites. As it reaches South America it runs ashore and spreads out north and south about twenty degrees. This warms the air above it, warm air rises, interferes with trade winds, mixes with the westerlies, and causes global temperature to rise . That is when we notice that an El Nino has started. But any wave that runs ashore must also retreat. As the El Nino wave retreats water level behind it drops by half a meter, cold water from below rises up to fill the vacuum, and a La Nina has started. As much as the El Nino raised the global temperature the La Nina will now lower it. They always occur in pairs and talk of El Nino-like or La Nina-like periods is just pure nonsense. The natural period of the oscillation is determined by the dimensions of the ocean basin and is about five years. In practice this can vary because there are other things happening in the ocean that can influence timing. El Nino has existed as long as the present equatorial current system has existed which is to say since the Panamanian Seaway closed. Nino3.4 is a good observation post because it sits there in the middle of the equatorial counter-current and records the presence of the El Nino waves before they reach South America. If you had read my book “What Warming?” you would know all that by now and I wouldn’t have to repeat it. Regarding other uses of Neural Networks in climate science – they have been used in at least one IPCC-referenced climate model – see Knutti et al. : “Probabilistic climate change projections using neural networks”, http://www.up.ethz.ch/people/plattner/Publications/knutti03cd.pdf. I have doubts about the legitimacy of neural network use in models – they have little to no explanatory power and even if they seem successful for some data runs, they can fail unpredictably. Soo true. I’m working on it. Sorry. I should have been more precise. Either variations in the Earth’s rotation are caused by mechanism in the Earth’s atmosphere and oceans or variations in Earth’s rotation is causing changes in ENSO. I believe bulges along the same latitude should have little effect on variation on Earth’s rotation. It should only occur when water is displaced between different latitudes that there are large effects on the rotation as this forces changes in Earth’s rotation to keep up with the angular momentum. I won’t comment on each of your comments. Instead I am going to make some general points. This what is published on WUWT is not peer-reviewed and I have never claimed that it is. It is out of personal interest I have made this research. I’m not associated with any academic institutions or have contact with any, although I have a M.Sc. degree in Applied Physics and Electrical Engineering. However based what I have found in my research, I’m now convinced that tidal forcing is the main forcing for ENSO fluctuations. For all practical purposes I’m not going to disclose in detail precisely how I proceeded or what type of optimization I made or what specific feature which it is that is responsible for the connections between the tides and ENSO variations. The only comment I’m going to make on that issue is that the optimizations which worked best make full sense based on physical principles. After all, this discovery has a certain monetary value. Not necessarily for me so much, but sure for others. Of course I’m going to continue to improve upon the results and I’m going to produce real time ENSO forecast, which should give the ultimate proof. I’m also interested to have my worked peer-reviewed by working together with some institutions. But, hey I’m a denier, after all! Lots of problems with this study. The main issue is the data source. Try using JPL for the lunar, Earth, Sun coordinates. Show the prediction for the next 10 years. Then there is something to talk about. In that case, I’ll make the general comment that you have refused to deal with the scientific issues I have highlighted. Very, very bad sign. Per, perhaps you don’t know this, but as soon as you refuse to respond to valid scientific objections, your paper goes in the trash can. Seriously. I don’t care if it is peer reviewed. I care whether you are willing to defend your work. Yes, we know that. You’ve stated it over and over. It is clear that you are convinced. The problem is, you think the fact you are convinced should convince us … it doesn’t, no matter how many times you repeat it. In that case, I don’t have a clue what you are doing posting on WUWT. This is a scientific site, surely you know that. By refusing to answer questions about your work, you are not acting as a scientist in the slightest, and your scientific opinion should be ignored until you are willing to be honest, transparent, and responsive to objections. Oh, please, not this coy nonsense about how you’d tell us but someone somewhere might make money off of it. I’m sorry, Per. I made a mistake. I thought you were a scientist. I didn’t realize you were playing businessman. Since you refuse to answer questions, you are useless to us and to science in general. However, you may indeed have a bright future as a businessman. So run along now, and make some money, there’s a good fellow. I would suggest it is more likely to be from the Earth’s core differential rotation outwards. The Earth’s core angular momentum (CAM) is unlikely to be shifted by ENSO or tidal oscillations. Comparing the AMO to the CAM a degree of correlation can be established, particularly strong since the early 1900s. The man threw a theory out there, if you must disparage something, maybe it should be the theory. None of this is/should be personal. Many here question the usefulness of Artificial Neural Networks (ANN). ANN is just a tool. It can be an effective tool, or it can be a confusing tool which doesn’t give useful results. Many have bad experience with ANN. Often they use off the shelf software and are unfamiliar with the method or data that they work with are not useful for use in ANN. I think myself that to be effective with ANN you have to get your hands dirty with ANN. I my case I have constructed the software myself and I have full control of what is happening with the program and its algorithm. Per, when your tidal peaks coincide with solar minimum, you will get a bigger amplitude El Nino followed by a deeper La Nina. The 1983 El nino was big because of the El Chichon volcano. This robbed some power from the ’87 El nino which started just after solar minimum. The ’98 and 2010 El Nino’s followed soon after Solar Minimum. The Pinatubo eruption caused a sustained succession but with lower peak levels of El Ninos. When power going into the ocean is reduced by volcanoes or solar minimum, the ocean uses the opportunity to lose some energy. Nonsense. The man didn’t “throw a theory out there”. He made a vague unsubstantiated claim that “tidal forcing” is a major factor in ENSO forcing. He provided no data or calculations to back it up. Then, when I asked him some plain vanilla scientific questions, he flat-out refused to answer a single one of my questions. At that point, my friend, he’s not acting as a scientist, and I have no further use for him. Finally, how can I “disparage” his theory? He hasn’t put forth anything remotely resembling a theory, and he refuses to answer questions about his claims … there’s nothing there to disparage. Willis never needs help to defend himself, and I am not writing to defend him. However, there are two fundamental problems with the discussed analysis and the argument between Willis and Per Strandberg illustrates both although Willis only states one of them. Per Strandberg has conducted a study using a neural network to identify relationships. This is problematic by nature because one cannot know what a neural network is actually identifying. Hence, there is an underlying problem: in principle it is not possible for Per Strandberg to precisely state what his system has done because he used a neural net. Therefore, he cannot answer some specific questions about much of his method. Willis asked specific questions about input data to the neural net which were in the form of “optimisations” and Per Strandberg refused to answer. It seems very likely that Per Strandberg cannot answer because his “optimisations” consisted of training the neural net then adjusting input parameters as a method to improve the training. This is a typical method for training a neural net (it is analogous to the military showing its system more images of tanks in my illustration). Willis gave up in frustration because – as he said – it is not science if what is done cannot be precisely specified. But training a neural net is not a procedure which can be precisely specified. More problematic is that the output of a neural net is not known with certainty. In this case, several posters have commented that the direction of causality is not determined. Indeed, as the military example shows, the output may not be indicating what one thinks one has trained the neural net to identify. Hence, I am in agreement with Willis and this agreement is not “personal” to either of the discussants. I agree with many of the criticisms that others have made. You have not shown causation, you have not shown a physical model that convinces me and many of the details are missing. I appreciate that English may not be your first language, but we need a lot more detail to evaluate your ideas. However, whether you have found a first order effect or an Nth order effect, what is interesting is if you have found a way to forecast ENSO. But I would like the detail filled in. He presented his thoughts, and you attacked him. Per Strandberg what you have done is very encouraging, I would be interested in whether you found a stronger signal in the phase relationship tidal effects or the declinational tidal effects (from the slowly changing 18.6 year Min/max culmination angle of the declinational component) or the 27.32 day long period from each declinational cycle. It is the declinational tides in the atmosphere, and oceans that has the most effect on changes in meridional flow patterns, and I would think that it would be a prime candidate for a mechanism for the effects you are seeing. detailed results from my line of research into global circulation patterns,and related weather effects, have shown a better repeatability when using either a 54 day long two cycle period or a four cycle 109.3 day period. Best results when looking at a 6558 day long pattern that considers the inner planet tidal harmonics as well. Have a look around my research pages, if you have the time for some mental stimulation on other possibilities than you have looked at so far. Gosh, Per, with that reassurance I feel so much better. The fact that you believe in the neural network that you built is so convincing, what can I do but fall in line? On a more serious note, the problems with ANN are well known, so I fear your reassurances ring hollow. The main issues are that they are difficult to train, often landing on local rather than global minima. They are also very problematic to interpret, often cannot outperform traditional methods, can get locked into minor or meaningless cycles in the data, and are subject to catastrophic failure. Can they work on a given problem? Perhaps, but they were developed a while ago, people (including myself) have worked on them for years, and they haven’t made much inroads into the world of modeling the real world. That should tell you something. I disagree that tidal influence has anything to do with ENSO. ENSO is made possible by the fact that in the Pacific both equatorial currents are blocked and as a result the warm water they carry piles up to form the Indo-Pacific Warm Pool, the warmest water on earth. ………. They always occur in pairs and talk of El Nino-like or La Nina-like periods is just pure nonsense. The natural period of the oscillation is determined by the dimensions of the ocean basin and is about five years. In practice this can vary because there are other things happening in the ocean that can influence timing. But it tends to make me think Per may be onto something with his tidal forcing of ENSO …. you are saying that the oscillation is related to the dimensions of the basin. If you are correct perhaps it (tidal forcing) is one of the “other things happening” which influences timing. ie if waves are moving within a basin, speeding and slowing of the movement of that basin must affect the wave motion. Sidorenkov in his publication “Physics of the Earth’s rotation instabilities” focuses mainly on “temporal variations in the atmospheric angular momentum and their contribution to the instabilities of the Earth’s rotation” as he discuses irregularity in the rotational motion of the earth. I am surprised that there is not more discussion in there on ocean currents, it seems it would be more significant. If you are correct in your theories Arno, then it seems it must follow that the variations in the earth’s rotation may have some influence in the periodicity and perhaps path of the ‘waves’ you describe. e my statement above: It should also be said that it may be nigh on impossible to separate cause and effect here… given the atmosphere, the oceans and the earth itself are all subject to these tidal effects, and differential movement of these different masses is interconnected. No sir, no way he presented his thoughts. He presented the most vague, misty, obscure, and handwaving of claims. I asked him about his thoughts, raising eight different serious scientific issues. He refused to tell me his thoughts, flat out refusing to discuss the eight individual issues that I raised. So no, UK, I didn’t disparage his thoughts, how could I? He wouldn’t tell me his thoughts. As to whether I attacked him “personally”, since he has given us absolutely nothing scientifically to discuss, I could hardly falsify his scientific claims—he had made none. All I did was, I pointed that out. Yes, that’s personal, I suppose, to point out that he is just blowing smoke … I’m afraid I don’t see how it can be otherwise. It’s personal, but it’s not a personal attack, UK. It is a statement of fact. He is useless to me, because he is unwilling to do what every honest scientist does—reveal his data and methods. But presumably he wants the scientific imprimateur of WUWT, so he has published this nonsense here, and then declines to defend it. I’m afraid, UK, that when anyone goes to comment about Per’s kind of action, trying to gain scientific traction by publishing on WUWT while refusing to answer questions or provide any transparency, well, whoever comments on that kind of BS is going to be talking about Per’s personal actions. No way around it. And no, I’m not happy about his actions. Posting here and refusing to answer questions? That’s not the WUWT way, and Per knew that coming in. Finally, UK, the relationship between the distribution of the ocean water and the length of day (LOD) has been known and discussed for years. In addition, the fact that the ENSO alteration affects the LOD has been known and discussed for years. Now, Per pops up and says, Hey, the ENSO isn’t affecting the LOD. The LOD is affecting the ENSO. Well, maybe so. To show that, first Per has to show that the current explanation (conservation of momentum, the “skaters’ arms” phenomenon) is inadequate to explain the change in the LOD. Has he done that, UK? Then Per needs to show some kind, any kind, of evidence that causality runs from the LOD to the ENSO, rather than the other way around. A Grainger Causality analysis, time delays, something. In fact, he has done nothing of the sort. He has made a very doubtful claim, offered no evidence to support it, then refused to defend it … and you are busting me for pointing that out? I’m sorry to discuss his personal actions, but he’s given us nothing else to discuss. I must agree with Willis, there is nothing here if you don’t disclose your calculations or your forecast [same problem Piers Corbin has],apart from the many obvious errors committed. A. What is the angle from vertical for a deceleration of 2 ms/day in 14 days? B. What will be the change in elevation of the surface across the Pacific Ocean do to that deceleration? From Deviation of Day Length from SI day (Wikipedia) it seems logical that the greatest rate of change in deceleration occurs during half a lunar orbit (14 days) and the chart says the maximum change is 2 ms / day in a short period. What constant acceleration nets a distance of 6.51 m in 14 days? The acceleration must be zero at the start and the end of 14 days (cyclic). So a better estimate is constant acceleration for 7 days covering half the distance, then reversed acceleration for another 7 days to cover the other half. by similar triangles, change in sea surface elevation across pacific ocean (19000 km) during deceleration. May I suggest 0.35 millimeters is much smaller than a molehill? Unless someone can point out a blunder here, I think changes in the length of day have insignificant manifestations in anything climatological. It is wonderful to observe and enjoy an active discussion of proper scientific method. I am humbled in the presence of great minds. The story of the artificial intelligence getting the images of tanks wrong can be found in the documentary “The Machine That Changed The World”, in part 4 I think. By my recollection though, it was a difference between sunny days and overcast days of the differences in identifying correctly or not the tanks. (I watched the original US airing of the series and still have them recorded on video tape). No, that was not what UK was trying to point out. I have to say I had the same view as UK. I was disappointed with your first post on this thread. UK did not say you should not point out the fallacies of his analysis. It was the way you did it that bothered UK and me. Go back and read your post. Now go read richards post (defending you). Richard did it without disparaging the author. You chose a different path. Not a big deal really, we are all grown ups here mostly, but I was taken aback by it. I have come to respect your writing here. You have a way with the word. I would have expected better than that from you. Now if the author had disparaged you in the past or treated you with disrespect, I could see where it might have been tempting to return the favor. I assume that was not the case here. There are lots of folks here with different levels of expertise and non expertise. I think for the most part we are in the same camp, we are seeking the truth. The author sounded like he was someone putting his own time into finding answers down a path he chose, thought he might have found a winning argument, and wanted to share it with the rest of us. Just because some takes a chance to stick there neck out, no reason to disparage him when you decide to chop it off. There are ways to tell someone they might be wrong without making them feel disrespected, you can just ask my wife. If you feel so strongly that the article was inadequate, maybe your beef should be with Anthony for posting it. ‘rgbatduke’ and ‘Willis Eschenbach’ say what I was planning to say but more elegantly. Per Strandberg: For all practical purposes I’m not going to disclose in detail precisely how I proceeded or what type of optimization I made or what specific feature which it is that is responsible for the connections between the tides and ENSO variations. Color me unimpressed. Until Willis Eschenbach’s technical criticisms of your work are addressed fully and openly, there is no reason for anyone else to accept your personal testimony that you believe the result. Go Home, I raised eight separate scientific issues regarding his claims. Rather than deal with the issues I raised, he cut and ran. Now that’s bad enough, but rather than deal with the issues I raised, you and UK want to lecture me on my tone. You don’t care about the gaping ragged holes in his scientific claims, you don’t care that he has cut and run, you pay no more attention to the scientific issues I raised than Per did. Instead, you want to lecture me on my tone, no scientific issues for you, I guess. Look, Go Home, I have no use for businessmen trying to pass themselves off as scientists, and I’m happy to tell people so. I see that you want me to blow in Per’s ear and tickle his stomach, or something like that, so he stays happy. Sorry. Not gonna happen. I don’t care if he’s happy. He comes here masquerading as a scientist and refuses to ask questions, claiming business reasons, I’ll call him on it. Per knows better than that, he reads WUWT, he knows about scientific transparency. So when he doesn’t want to be transparent, when he doesn’t want to reveal his methods, when he refuses to reveal his predictions, yes, I’ll bust his chops. You keep trying to cast this as Per the poor scientist trying to get his voice heard and me cruelly jumping on him. That’s not what’s happening. Instead, we clearly have Per the businessman trying to masquerade as a scientist, in order to provide some kind of scientific imprimatur for what is no more than a quarter-baked claim. • I object to him passing himself off as a scientist while refusing to act in a scientific, transparent manner. • I object to him not revealing his ENSO prediction(s). • I object to him using WUWT for his business purposes. • I object to his refusal to answer scientific questions regarding his theory. Finally, yes, Go Home, I know that there is likely some nice, California-approved, sensitive New Age way to tell a man that he is not welcome to come in to WUWT, make pseudo-scientific claims, and then refuse to answer questions about his claims. I suspect that either you or UK could tell Per that, in a way that wouldn’t ruffle his feathers in the slightest. What you guys fail to understand is that I want to ruffle his feathers. I don’t want him to be at ease while refusing to answer questions, I want him aware of the scorn with which I regard that kind of cheap trick. I don’t want him walking away thinking he got away with it. I want him to walk away hanging his head, and take his business reasons with him. I want to discourage him from this course of behavior. And most assuredly, I don’t want anyone else to try this kind of nonsense, posting up some claims on WUWT and then running away when people ask questions. If making Per squirm about his actions serves to dissuade one person from doing the same, I’ll consider it a win. You and other people keep assuming that I pick my tone at random, or that my tone reflects my instantaneous emotional condition. It is rare that either one of those is true about me. I pick and choose my words, and the tone of my words, with great care. It was my intention to be aggressive and unbending with Per. I really don’t like that kind of action, and despite my attempts to be a reformed cowboy, I retain enough of my upbringing to simply tell the truth about that. calculates tidal forces on several different time scales, most longer than ENSO, but the cycles considered might help you tune things more closely (the lunar orbital changes are on several time scales and causes). find a sixty year cycle, for example. It pretty much explains the 60 ish year weather cycles and ocean (PDO etc.) changes. ENSO has a period of approximately 5 years. Earth’s magnetic field (generated in the liquid core) has two dominant periods 21.3 and 5 years. 21.3 years can be directly linked to the Hale cycle, because exactly 21.3 years is the period of the sunspot magnetic cycle since 1880. It is unlikely that the ENSO is able to ‘shift’ the liquid core circulation, more likely is the other way around, considering the mass ratios of the corresponding components. In support of the ‘outward’ hypothesis it can be demonstrated that the tectonics of the sub-equatorial Pacific correlates with the ENSO time line. Some of the commentators are evoking ‘predictability’ as a proof of a hypothesis. That may not be always possible, in such a case science is reliant on the backdated correlation, as it often is, e.g. by using ice core sampling data, magnetic polarity in the mid Atlantic ridge, etc. ‘Predictability’ is desirable but not essential to the instituting of a new understanding of a physical phenomenon. Obviously, Willis needs no help in articulating the true spirit and specific values of the scientific method. Bravo, Willis! And Braddles too, for instantly becoming skeptical when Per announced his revolutionary ENSO predictions for the next decade were top secret. One doesn’t need PhD in physics to smell, uh, confirmation bias. The common sense of an illiterate fishmonger will do just fine. Btw, Anthony is perfectly on topic by making his venue available for bleeding edge new ideas. WUWT is a forum for free and open debate, not a realclimate mouthpiece for micro-polished propaganda. It is entirely predictable that some ideas presented here will not withstand thread scrutiny. Just to be sure, none of us can have any idea whether Per is on to something based on the sales pitch he has presented anymore than we can be sure that a Ford is the best car for your money based upon the glossy brochure at the dealership. Being ever the optimist, I had hoped Per had found the Masonic key to ENSO while reading his post. Sadly, his form stinks of the same post-mod trust-me appeal-to-authority rot that WUWT and Climate Audit, et al, stand as bulwarks against. Nevertheless, this is the kind of wide ranging, highly instructive, madly unpredictable thread that makes WUWT the most sage science blog on the bloody planet. We learn best from error deconstructed. I haven’t a clue, but my first guess is that changes in the earth’s rotation rate are contolled by conservation of angular momentum, when there are mass redistributions due to earth quakes, ocean currents etc. ENSO is associated with changes in atmospheric pressure and hence changes in sea level. Thus it seems plausible from this effect alone could affect rotation rates. The question is do the numbers add up? The danger of doing this kind of correlation study is running foul of good old correlation is not causation. ANN with backpropagation is a commonly used method. I have used backpropagation. It is a fast method but suffers from problems. It is inflexible, and results in most cases get stuck in local minima. Therefore, I don’t use backpropagation. Instead, I randomly pick weights. Then I change the weight by adding a step. The size of this step is then chosen randomly within a set of limiting borders. Which makes it possible for the program to jump over local minima. Then if, the result improves I keep the new weight or if it doesn’t I keep the old weight. By doing this, I eliminate the risk of getting stuck in local minima. True, this method is slower, but I avoid getting lost in minima. It almost always converge and I avoid the risk of divergence in the training set. First, is it possible for reversible tidal effects to influence ocean currents? Keep in mind that the measurable effects on LOD, those of fortnightly frequency, are about 99.99% reversible–that is, terrestrial angular momentum is retained, angular velocity is recovered. Which is no say no energy has been transferred to or from the hydrosphere. That tiny fraction of tidal friction which transfers the earth’s angular momentum to the moon–mainly due to semi-diurnal tides–is right at the edge of the IERS’s ability to measure. Clearly the world’s rivers have a far greater–but still negligible–capacity to affect ocean currents, than irreversible tidal effects. The tidal force is the weakest of measurable terrestrial influences–a gentle sloshing across the ocean basins of a fraction of a mm is sufficient to raise the water along the shores. The tidal bulge is wave, not a current, and a weak wave at that. The idea that it governs ENSO is as far fetched a claim as ever there was. Why waste statistical analysis on conceptually flawed hypotheses? Science is (or should be) a full-contact sport. You figuratively bash the brains out of opponents/other players & expect no less in return. Afterwards, you shake hands & maybe even have a beer w/him at the local bar. It does not follow. Angular momentum and energy are entirely different things. Many spin stabilized spacecraft, for instance, are controlled by dissipating energy to damp nutation, while angular momentum stays constant. I’d recommend using a feedback neural networks (NN) – not to be confused with back propagation or error correction – also known as a recurrent NN – instead of a feedforward NN. Feedforward NN is for static pattern classification. For a time series, you need a feedback NN – or RNN. which is now part of PyBrain. Also, since the stratosphere is thermally stable (warm on the top and cold on the bottom) I’d recommend using the phase of the QBO winds as an input. The QBO is actually an oscillation – unlike ENSO. RE: my 9:18 pm back-of-the-envelope calc above. It turns out I did blunder in my last step. So a 2 ms/day increase in LOD over 14 days, will create an surface equatorial lateral acceleration that will make the surface of the Pacific Ocean just 0.035 millimeters, 35 microns, higher in the east (Panama) than the west. (Jakarta). That is less than the thickness of 1.5-mill painter’s plastic – stretched halfway around the world. How about Nino around 2013, 16, 19, 23-24 and 27? It depends on geometry. Take a shallow rectangular pan, fill with about an inch of water, float an object on it. Keeping the bottom of the pan on the table, move it gently in a circle. The object will begin following the wall of the pan. Bottom and edge effects are important. Try this with a bottle of water so no surface wave can form and a suspended object remains immobile. Want to borrow my shovel? All that furious digging, yours is bound to be nearly worn out. There are times I wax eloquent. And then there are times I am just a cheeky little Irish elf. To this post: “nuts”. No, it is training the neural net. But your question is important because it goes to the nub of the underlying problem with the study which I stated in my post at January 20, 2013 at 4:31 pm. You also don’t use the scientific method, so whether you use backpropagation is meaningless. If you did use the scientific method, you’d answer the questions that I asked, and provide links to your data, and expose your methods, and publish your predictions, instead of trying once again to sneak your unsupported, uncited opinions in under the radar. Oh, wait, I forgot … you don’t want to reveal your special Kentucky Fried Science secret recipe with 11 special herbs and spices, for business reasons … fine, no problem, see you in the Yellow Pages, but if you are a businessman, what the heck are you doing posting here? The issue here is not the method that you used to get your wrong answers, Per—it is that your answers are wrong. Even that would be bearable if you provided data and methods. But so far, all you’ve done is turn up with your theory in one hand and your johnson in the other. You’ve got no data, no supporting information, no computer programs, no citations, no logical conclusions, no agreement from other researchers, nothing scientific at all, and I hate to tell you but your johnson isn’t all that convincing in the science arena either. You still seem like you don’t get it. This is a science site. We don’t care about your strong belief that you are right. We don’t care about your assurances that you are a black belt in neural networks. None of that gets a look-in here, we’re interested in science. Please go away until you have some actual science to share with us. You know, data, methods, transparency, results, that kind of thing. No gyroscope ever broke Newton’s laws of motion, namely, for every action there is an equal and opposite reaction. If something starts spinning you’ll have to burn some fuel on the retrorockets. You are denying the most elementary physics. I’ll grant that I could have said, whatever energy was transferred from the lithosphere to the hydrosphere is returned to the lithosphere, but all these transfers of potential energy (angular momentum) involve energy. … Willis gave up in frustration because – as he said – it is not science if what is done cannot be precisely specified. But training a neural net is not a procedure which can be precisely specified. Richard, while I agreed with almost all of your interesting post, I must take exception to this one admittedly minor point. Training a neural net is indeed a procedure that can be exactly specified. It is nothing more than a series of steps, why would they be unable to be specified? You specify the details of the net, you specify the training data, what is unspecifiable? What am I missing? In any case, I gave up in frustration, not because of the neural net issue, but because Per refused to answer questions about his data, methods, predictions and conclusions. I don’t have time for that kind of coy nonsense, that’s not science in any sense. Willis! Coffee! Spit! Computer screen! Paper towel! Training a neural net is indeed a procedure that can be exactly specified. It is nothing more than a series of steps, why would they be unable to be specified? You specify the details of the net, you specify the training data, what is unspecifiable? What am I missing? You are right. You missed nothing. I stand corrected. Sincere thanks. Prompted by your post I have given more thought to the matter and add the following. At very least Per Strandberg could have specified if he had trained his network by use of supervised learning, unsupervised learning and reinforcement learning. From his description I inferred that he used reinforcement learning but on consideration that inference is an assumption on my part. This addition in a post also shows that your correction of me is correct: the addition would not have been needed if it were in the paper. In my opinion the list of “random weights” does not seem to be a serious omission but failure to state the determined optimum ‘weight’ most definitely is a serious omission of the paper. So, you are right and I thank you for correcting me. Hopefully, this reply will correct any misleading impression I may have provided. Please note that my post did agree with your objections that the paper ‘is not science’ for the reasons you had stated. Tidal effects are dissipative. That’s why the moon is slowly receding. Here’s a hint: the set of all energy states subject to the constraint that the magnitude of angular momentum is constant is non-empty. You are arguing against well-established physics. This stuff is used every day in practical applications. I gave you a hint about satellites and nutation dampers. Do a little googling on those terms, and you will find information. Here’s a good place to start: the classic case of the Explorer 1 satellite falling into a flat spin. Should have said: “Here’s a hint: the set of all energy states subject to the constraint that the magnitude of angular momentum is constant is non-trivial. It is not a singleton point. You know, I don’t agree with Willis’ tone, and it’s a bit uncomfortable watching him dress down a guest author answering questions. To do this, I had to make complicated trigonometrically calculations in order to get the right value of the tidal force. Eventually, I got good correlations between ENSO and the tidal forcing. By this time, I had figured out which features in the tidal forcing that were causing this correlation. However it was not a direct correlation with ENSO, rather it was a correlation with the derivate signal of ENSO, i.e. it was affecting the rate of change of ENSO. Concerned about this, I raised eight specific scientific issues. His answer? Sorry, but I’m not interested in “general points”. I’m interested in people who are willing to answer questions, to explain and defend their theory. And no, Duke, he’s not doing that. Those are the “irreversible” tidal effects. These involve permanent LOD increase and involve no change in earth rotational inertia. These are not measured by the IERS, but are calculated from lunar laser ranging. These are four orders of magnitude weaker than “reversible” tidal effects. It is the analysis of “reversible” effects as reported since the invention of crystal clocks which are analyzed by way of LOD. These are by definition impossibly related to ENSO: energy must be conserved, and they involve no irreversible energy loss. Four centuries of telescopy have also shown reversible effects, but combined with irreversible, long term tidal dissipation. It’s not often you come up against such a stark display of Dunning-Kruger. I’ve given you some links, and some keywords to search for, kid. Don’t bother me anymore until you have learned something. Whatever the merits, or lack thereof, in tying LOD to energy in the hydrosphere, this statement is false on a very elementary level. Angular momentum is not energy. To measure the change in energy, you would need to measure the change in nutation, not spin. And, because the Earth is so massive, it doesn’t take much to result in massive energy transfer. I’m not saying there is such transfer going on, mind you. That is TBD. But, you aren’t even asking the right question, so your answer, as Pauli would say, isn’t even wrong. Bart, once again you show your hopeless lack of background in physics. Whoever said angular momentum is energy? Not I. But a change in AM certainly does entail energy expenditure. And no change in AM certainly does entail no energy transfer. It’s that simple. And you don’t understand the simplest physical concepts. The LOD is measure of the change in the Earth’s spin. The Earth’s rotational or orbital motion is actually complicated. Although it might appear to a naive observer on Earth that the Moon is simply rotating about the Earth, it’s also co-rotating with the Earth around the Sun – which causes the orbit of the Moon around the Earth to precess with a period of approximately 18 years. Or stated slightly differently, the trajectory of the Moon in the sky is not constant – and on clear days not all high or low ocean tides are equal. This motivated the first further development of the Eulerian theory of rigid body dynamics after nearly 200 years—to address this kind of momentum-preserving energy dissipation. Ordinary East-West tides give us ordinary, and well cataloged and understood, short term effects. The question we are looking at here is what linkage there may be with ocean dynamics and long term climate. Nutation of the Earth’s axis has a very distinct likelihood of playing a significant part in that. The oceans damp the nutation, and in doing so, they dissipate energy in the form of heat. The effect is only second order observable in spin, so a small signal in LOD is hardly unexpected. This is all standard theory. Rail against it and stomp your feet however you like, people are still going to use it, as they have been doing for decades before Mr. A. G. Foster, Jr. came along. Because it works. I suppose I should respond to this nonsense, for any who do not have the background to immediately grasp what a ridiculous clown this Bart is–after all, he actually has a paper to back up his junk science. He quotes me: “And no change in AM certainly does entail no energy transfer.” Does he now accept the validity of this obviously correct claim? Can’t tell–he claims external authority regarding its…what? Whatever he is claiming, he prefers to keep it very vague, maybe recognizing he is wrong but still claiming he is right. And yes, he actually has a paper claiming nutation affects climate: “Earth nutation influence on the temperature regime of the Barents Sea,” written by one H. Yndestad, 1999. For the information of any who are still tracking this thread, the author is claiming that an 18.6 year wobble of about 17″ of arc–this amount to a radius of about half a kilometer–causally correlates with temperatures in the Barents Sea, and with climate generally! @Agile Aspect: The LOD is measure of the change in the Earth’s spin. Earth’s rotation is the rotation of the solid Earth around its own axis. I’m not saying Wikipedia is an authorative source. If I’m wrong in using the word “rotation” instead of spin, I’ve got a lot of company. I’m not saying Wikipedia is an authoritative source. If I’m wrong in using the word “rotation” instead of spin, I’ve got a lot of company. Uh, NO, because it is hopelessly ignorant and wrong. Can you not read, either? As for that Barents Sea paper, a consideration of the Energy needed might be worthwhile. Problem What is the kinetic energy of the earth’s rotation about its axis? Suppose we dissipate all that rotational Kinetic Energy through the Earth’s oceans as a form of heat flux, which completely neglects significant Potential Energy that ought to go into raising the moon’s orbit due to tidal drag. Let’s pick a heat flux that is small compared to hypothetical CO2 forcing, like 0.1 W/m^2. Millions of years at constant loss rate KE/E_rate = 229 million years. How big is 0.1 W/m^2? That’s about like trying to change the temperature of an Olympic size Swimming pool (in surface area) with a 100 watt light bulb. Clearly, I can change the t-halflife to 1.5 billion years if I reduce the heat flux to 0.01 W/m^2, but then I’m trying to heat an Olympic pool with a 10 watt night-light. And I still have a moon to lift in orbit. A very confused analysis. Basically, a determination of the time for slowing down the spin rate to zero needed to release 0.1 W/m^2 on average. And, this proves… what? That it takes a very long time at that meager rate of energy dissipation to come to a stop. No duh? You guys do not understand nutation dynamics, the storage of energy in the perturbed motion of the spin axis induced by disturbance torques, and its subsequent release through dissipative mechanisms, in particular by the action of viscous friction within the oceans. Such dynamics are old hat. Textbook. I can pull out my undergrad textbook (many moons, and advanced coursework, ago), Kaplan, Modern Spacecraft Dynamics and Control, page 127, Energy Dissipation Effects – it’s all right there, and this book is considered very, very basic. Mr. Foster complains I haven’t a high school understanding of physics. That is one thing he got right. I do not. You guys apparently do. Congratulations. Now, run along and do your homework. Solid planets also undergo tidal braking, which is why the moon, Mercury and Venus, and many of the moons of the giant planets have locked-in rotation behavior. Thus much of the earth’s tidal braking is dissipated in the lithosphere, but of course the majority of this feeble heat too must work its way out through the ocean. At the current, unusually high, rate of deceleration it would take the earth over a billion years to stop (non-exponentially). George Darwin calculated the age of the earth at 2.2 billion years based on his info on secular rotational (negative) acceleration. Nutational transformation of rotation energy is a whole lot weaker than total rotational energy (by a factor of somewhere in the ball park of sin 15″, I would suppose). Moreover it is not at all apparent (to me at least) that the torques involved apply to the lithosphere to the exclusion of the ocean. For all I know more torque per mass is applied to the seas than to the solid earth. I don’t have a dog in this fight but it seems to me if you want to try and relate changes in tidal motions to the ENSO, it might make sense to relate the observed properties of the ENSO to those tidal motions. Per my understanding ENSO changes have particular spatial-temporal characteristics – for instance, an El Nino begins with an anomalous warming in the Eastern Pacific waters along with a reduction/change in wind patterns. Can the tidal motions reproduce these specific spatio-temporal patterns? Any change in LOD seems like it must affect the Earth as a whole equally and not preferentially favor an effect in the Eastern Pacific ocean and the atmosphere above it. However, I may be mistaken, perhaps there is some geological/hydrological feature of the Earth that might account for this. u.k.(us): The man threw a theory out there, if you must disparage something, maybe it should be the theory. Willis did exactly that in his first post. Almost immediately thereafter I posted a very encouraging note essentially seconding some of Willis’ critiques (especially the secrecy) and inviting more detail. The entire subsequent discussion of Willis’ tone is a total red herring. From the start, Per Strandberg ignored the substance of the critical commentary on his work. That’s what turned the discussion away from the ideas and toward the man. where I1 etc. are the inertias and w1 etc. are the rates in a body space coordinate system aligned to the principal axes. In the absence of external torque about the spin axis, the angular momentum stays constant. Setting T constant defines another ellipsoid, the inertia ellipsoid. If T remains constant, the rate trajectory is confined to a connected intersection of the two ellipsoids. The requirement that H remain constant, however, does not dictate that T remain constant. As energy dissipates, and T shirnks, the rate trajectory is confined to the evolving intersection of the two ellipsoids, the static momentum ellipsoid, and the diminishing inertia ellipsoid. Only when the intersection shrinks locally to a single point, and the inertia ellipsoid is fully contained within the momentum ellipsoid, does T become constrained, and energy dissipation cease. It is not difficult to find information on this if you trouble yourself to do a search, e.g., here and here. Nomenclature varies. In spacecraft engineering (see last sentence, first paragraph), any off-nominal spin condition which creates time varying stresses is generically referred to as nutation. Having a small nutation angle does not necessarily mean the rate of energy dissipation is small, as the energy dissipation is a result of movement of the dissipating medium. Efficient dissipation of energy is what keeps the nutation angle small. On spacecraft, dissipating elements often consist of fluid filled vessels or conduits. Engineers trade off dimensions, along with fluid viscosity and density, to optimize the rate of dissipation which damps out vehicle nutation induced by disturbance torques. I thought Anthony’s website was a place of discussions about new ideas on subjects related to the climate. In my work I have always followed where the data takes me, rather than followed some preconcived ideas on how things work. So when I found that specific tidal data correlate well to the derivate value of ENSO, I followed that path. The difficult part then was to introduce feedback and then to get the Neural Network to became stable and to respond to the tidal data input. So I simply raise my hand here and say I found something. Because, I think that the fact that the tide play an impartant part in ENSO forcing is a discovery of some importance. My work is an ongoing prosess and I do want to publish the result with full explaination and transparency by working togheter with others. Those other must however behave in a civil manner and have integrity. Altough I don’t mind frank discussions. Your correlation certainly appears solid. But, of course, correlation is not causation, and the variation in LOD is very small. The energy dissipation effects I have been attempting to explain would also be correlated with the LOD, but could be large enough to be a driver of ENSO. If there are data sets of polar motion available somewhere, you might try looking at those correlations. Here is info and data. In the discussion above, I referred to the “inertia ellipsoid”. This seemed an odd bit of nomenclature to me, but it was what they chose at the wikipedia link and I didn’t want to muddy the waters. Looking back at the link, I think the writer just got sloppy, so I would advise any readers following the discussion not to adopt that convention and call it the “energy ellipsoid” instead. Bart, the equation you’re looking for is T = dL/dt, where T is torque and L is angular momentum. Wiki says: “Angular momentum is conserved in a system where there is no net external torque…” and Likins (your source, p.3) says: “As no further change in angular momentum can occur [after the perturbation is removed], energy cannot be dissipated without limit…” which of course corresponds to my statement: “And no change in AM certainly does entail no energy transfer,” which you curiously seem to think you have disproved. The trivial difference between my version and the other is that I use the general term “energy” whereas torque is a specific kind of energy: mechanical and rotational. I like the way Likins writes and thinks. He goes so far as to consider the etymology of the terms while sorting through inconsistent usage. He defines precession as a response to external torque, and nutation as an internal response independent of (external) torque. Yet he relates how with spacecraft problems the distinction can depend on the frame of reference. He continues the above quote: “…consequently the body must in time approach again a state in which no relative motions occur.” Relating this to earth science this amounts to removing the earth from outside gravitational influences, which if done, precession and nutation immediately stop, but a few million years are required for the earth to dissipate accumulated tidal heat. The mantle would cool to a stable temperature determined by radioactive decay, and the core might shrink a little. Rasey has the right approach to both problems–tidal effects on ENSO and nutation effects on SST–he quantifies! This immediately constrains the possibilities to the level of the insignificant. I added to that the thermodynamic objection that only irreversible tidal processes entail conversion to heat which leaves on the table only that energy that corresponds to the translation of the moons orbit. And this is according to basic principles of conservation of energy which I correctly stated, and which you continue to deny. Accordingly the LOD data, which almost entirely deal with reversible processes, i.e., changes in rotational inertia, can have nothing to do with tidal heating, nor with ENSO. As long as the sun and moon are out there precession and nutation will continue, and angular momentum will continue to be transferred measurably to the moon. The little bit of corresponding kinetic energy will continue to heat the mantle directly, the seas indirectly and even directly a tiny bit, but this is just nothing compared to the energy the sun shines on the globe. The bottom of the ocean is warmer than polar seas not because of radioactive decay but because of warm, salty water from the Red Sea, Persian Gulf, Mediterranean, etc., and it’s still pretty cold down there. This sentence: ” Accordingly the LOD data, which almost entirely deal with reversible processes, i.e., changes in rotational inertia, can have nothing to do with tidal heating, nor with ENSO,” needs obvious qualification to: “…nor with ENSO by way of tidal heating.” ENSO and LOD certainly are correlated by way of atmospheric coupling, and by way of sea currents. Also LOD shows AM transfer between the lithosphere and fluid spheres (which involve no change in inertia). Atmospheric coupling has been extensively analyzed and effects attributed to LOD accounted for. Tidal effects are fairly modeled as well. The IERS provides data with noisy tidal effects removed. No, torque is not energy, either. The change in energy due to torque is found by integrating the dot product of torque with angular rate over time. Your charade grows tiresome. I have tried to lend a helping hand. You refuse to learn. Be that way. No, T is the traditional symbol for kinetic energy in Lagrangian dynamics. The Greek letter “tau” is commonly used for torque. The equation tau = dL/dt only holds in an inertial (non-accelerating, hence non-rotating) coordinate system, in which the inertia tensor is not constant. Within the body fixed frame, where the inertia tensor is constant, the equation is tau = dL/dt + cross(w,L), where w is the angular rate vector, L is the angular momentum vector, tau is the torque vector, and “cross()” denotes the vector cross product. This is Euler’s equation. When you add dissipating elements to the equations of motion, they have the effect of bleeding off energy while leaving angular momentum constant in the absence of external torque. With the addition of external torque disturbances, they have the effect of limiting the accumulation of energy from the torque by dissipating the input energy. You are wrong, and way, way, way out of your depth. Good-bye. This is zero if tau is zero, OR if tau is orthogonal to L.
So, if tau has a component along w, but is orthogonal to L, then the energy will change while the magnitude of the angular momentum stays constant. Dissipating elements impart precisely such a torque. If you want to learn any more, then you will address me respectfully. If not, you can go take a flying leap. Any tutor would help. Your knowledge is extremely limited, and your assertions have no merit. “The tidal bulges are very small, seemingly insignificantly small, compared to the radius of the Earth. But over the huge area of one of the oceans, the tidal bulges alone still raise a huge amount of water. We have discussed these using the conceptual model of a stationary Earth-moon system without continents, but with a uniform depth ocean covering its entire surface. We do this to emphasize that these tidal bulges are not due to rotation, but simply to the variation of the moon’s gravitational field over the volume of the Earth. Yes, modes of oscillation due to the shape of the ocean basins are part of the puzzle. The important thing to remember is that, even when motions appear relatively small, when considered over the vast expanse of the oceans, the energies involved are immense. Thus, a particular avenue for energy flow cannot be summarily dismissed without putting numbers to it. Being 92% efficient with an 1883 meter head, the Swiss Bieudron turbines spew out water .35 degrees C warmer than the head waters. (At zero efficiency it would be 4.5 degrees C warmer–with a 6160 foot head.) Water going over Niagara Falls heats up .14 degrees C assuming total conversion of potential energy to heat (in fact some energy goes towards erosion). So at grossly exaggerated heights and assuming totally irreversible processes we still have barely measurable effects on temperature. May or may not be. You can look through the discussion and see that I’ve never been categorical. But, your examples fail to capture the dynamics we are talking about. Nutation stores energy, it can accumulate over time. When released in waves, it can alter temperatures dramatically in cyclical fashion. It would take some very involved analysis to determine just how much, but the signal for which we are seeking a cause is a mere +/- 0.2 degrees in the approximately 60 year climate cycle observed in the surface air temperatures. That cycle is what reinforced the longer term warming from the LIA in the latter third of the 20th century, leading to the AGW panic. Believe it or don’t, it doesn’t matter to me. But, the possibility remains, and we have established that your earlier hubris in rejecting it outright was ill founded. 1. Nutation is fairly constant. How can any climate cycles be correlated to constant nutation? 2. Nutation involves energy transfer to the ocean of many orders of magnitude less than that of fortnightly tides, which are much weaker than diurnal tides (as far irreversible energy dissipation is concerned), which in turn are much weaker per volume than Niagara Falls. You have not even tried to make a case for nutation. All you have done is referenced a crackpot paper. Have you no BS detection skills whatever? After repeatedly being shown to be wrong, you remain pugnacious and ungracious. You haven’t a clue how the system works, and I am fed up with your incivility. The earth has a kinetic energy of rotation of 2.14×10^29 J = 5.1×10^28cal. 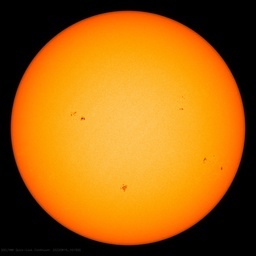 A mean solar day is 86400 seconds long. .0023sec/86400sec = 2.66×10^-8. 2.66×10^-8 x 5.1×10^28 cal leaves 1.36×10^21 cal/century to heat the ocean. (Sea water has a specific heat capacity of about 5% less than fresh water.) The ocean contains 1.3×10^24 ml of water. So, 1.36×10^21 cal / 1.3×10^24 ml = 10^-3 degrees/century of ocean heating by tidal friction–one thousandth of a degree, if I haven’t screwed up anywhere.